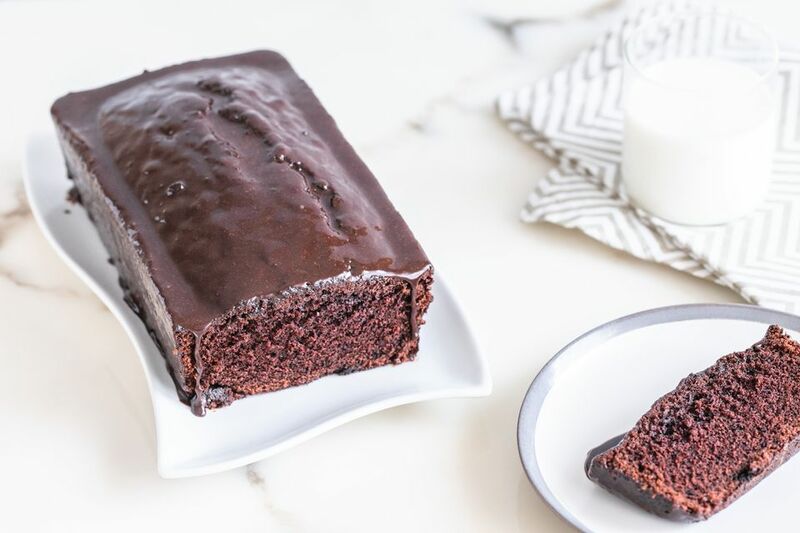 This chocolate loaf cake is the perfect size for a family dessert, and it is easy to prepare and bake. The cake and the simple chocolate glaze are both made with cocoa powder. Serve the cake with a scoop of ice cream for an incredibly delicious dessert. Note: while there are multiple steps to this recipe, this dessert is broken down into workable categories to help you better plan for preparation and baking. Heat the oven to 350 F (180 C/Gas 4). Grease and flour a 9-by-5-by-3-inch loaf pan or spray with a baking spray (with flour in it). Beat sugar and butter together until well blended. With the mixer on low speed, add the salt, vanilla extract, baking soda, baking powder, and cocoa. Mix until blended. Add about one-third of the flour and half of the milk and mix on low speed until blended. Add another one-third of the flour and the remaining milk and mix until well blended. Add the remaining flour and mix until blended. Do not over-beat. Pour the batter into the prepared loaf pan and spread evenly. Bake for about 60 to 65 minutes, or until a toothpick inserted in the center comes out clean. Remove to a rack to cool in the pan for about 10 minutes. Carefully remove the cake from the pan and cool completely on a rack. Glaze the cake with the chocolate glaze (directions below) or frost as desired. Sift the confectioners' sugar into a bowl and set aside. Whisk in the cocoa powder and milk and continue cooking and stirring until thickened. Remove the chocolate mixture from the heat and whisk in the confectioners' sugar. Thin with more milk, if needed, or add more confectioners' sugar if a thicker icing is desired. Spread or drizzle the warm glaze over the cooled cake. Once the glaze is firm, cover the cake with foil or plastic wrap. Store leftovers at room temperature for up to 3 to 4 days or refrigerate for up to 1 week. The unfrosted cake may be wrapped and frozen for up to 6 months.